You know those little tender mercies you get, that fill your mama bucket? Those times you take a deep breath, close your eyes, and try to record every little detail that you are experiencing. I have found one thing that fills my bucket every time! It’s simple….all I have to do is turn the music on! Music is such a powerful thing and so wonderful! When I turn on the music, it’s like a magnet. My boys come running! They laugh, they dance, they are silly! They let loose like no one is watching, and I LOVE IT! The fast songs are crazy and full of laughter, then a slow song comes on, and this is when my heart strings gets pulled. I get two little boys, one on each leg, and a third in my arms! Whenever I need a good dose of pure happiness, I turn on the music! Not only has research shown that there is a strong correlation between music and academic achievement but I believe it is also very healing! The right kind of music opens your heart and mind to a higher place! Two of the most amazing minds made these statements about music….. Here are 3 ways to keep the music and the slow dance going in your home! 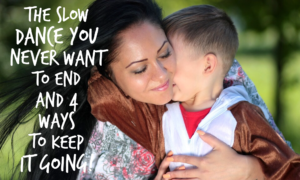 #1 – If there is one thing that I have learned the most as a mom is lead by example! If your kids watch you listen to good music, or watch you dance around like a crazy person, and see how happy it makes you, they will emulate that example! While I am making dinner I turn the music on, we dance and laugh and go crazy! #2 – Sometimes you need to turn the lights off! There have been times when my boys just watch my craziness as I sing and dance around the kitchen! They wouldn’t join in at first, until I turned the lights off! They all went crazy! Singing and dancing in front of people can be a little intimidating! Especially if your by someone who really can sing and dance. When the lights are off, you have a sense of protection that no one is watching! You are free and able to look as crazy as you want! My boys love this so much and often get out some head lamps and turn them on the flashing mode! It turns your dance night into a disco night! #3 – Provide your kids with great, uplifting music that teach great things! If these great lyrics are stuck in your child’s head, then perhaps those words will become ingrained in their mind and turn into great actions! You are what you think! There are so many great classics and new songs out there that have great messages! #4 – Encourage the love of music! If your child doesn’t want to join the choir, or they don’t want to share their talent with others, than that’s ok! If you force them to it they may come to resent music! My son has a great voice and I bugged and bugged him to sing in a children’s choir. He had no desire. I thought about making him attend, but I had a strong impression that if I did, he would begin to hate music. Having the music on in your home will implant in their souls the importance of music. We often sing around the piano, as I play for them. At some point, they may even feel confident enough to share that love with others! 6 Things Every Parent Should Know BEFORE You Begin Homeschooling!